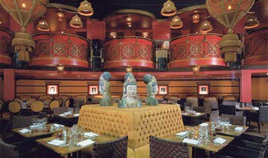 Mandala Ray or Man Ray restaurant is a good choice for visitors willing to enjoy a trendy place for a dinner in Paris. The setting is clearly unforgettable. Depending on the event, the restaurant can be the theatre of huge dinner parties, business meetings, or large or intimate private evenings. A cosmopolite lounge bar, restaurant and select night club during the week-end. The cuisine served is refined world food... A hip place to eat in Paris.